BIRDS-3 project has always been prudent about interviews we give out to the media. We are extremely weary that things would 1) blow out of proportion 2) that media will either misquote or write something that's completely fabricated. These could potentially compromise our relationship with our stakeholders, and that's the very last thing we want to do. Well, both happened in today's NayaPatrika. The good thing about all this is that everything was on the record, and the author has all the recording if necessary legal action has to be taken. However, it makes no sense to go through all this when things have already been published. The only way forward is to document what's been written and what was actually said. Nope. Never said that. I think the journalist has no concept of how quoting someone works. स्याटलाइट निर्माण कसरी गर्नुभयो ? यो कसको योजना हो ? First of all, I never explicitly stated that I was the one who brought the project to NAST. Also my PhD is not in anyway related to the BIRDS-3 project. It was the effort from my advising professor and principal investigator of the BIRDS project, Prof. Mengu Cho and Kyushu Institute of Technology. I was following protocols. We wanted a host organization to take leadership on behalf of Nepal. Nepal Academy of Science and Technology undertook that role. We have total of 8 students working in the project. Two from Nepal, two from Sri Lanka, three from Japan and one from Bhutan. 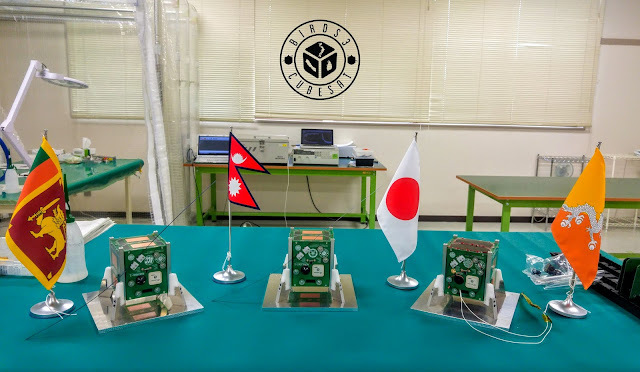 BIRDS-2 project built first satellite for Bhutan and BIRDS-4 is building the first for Paraguay. स्याटलाइट पठाएर नेपाललाई के फाइदा छ ? नेपालमा अरू के सम्भावना छ ? सरकारले के गर्नुपर्छ ? Big satellites have never been on the agenda at the moment. The current satellite is a 1U CubeSat standard. The sweet spot for doing meaningful missions is a 3U as shown by commercial, data mining and communication companies. We could, if possible, aim for a 3U. But that's after we improve our baseline understanding of the technology involved. Regarding groundstations, well, there are many, many groundstations all round the world. What I was getting at was the BIRDS ground station network spread across Americas, Africa and Asia. NepaliSat-1 can utilize that.